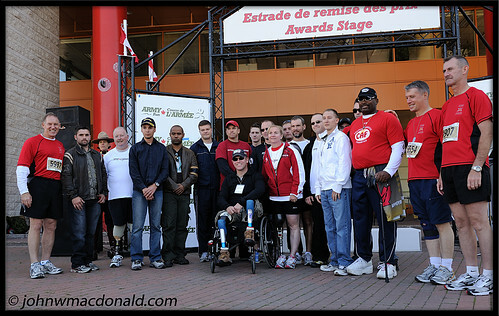 Army Run 2008 - Injured Soldiers, originally uploaded by johnwmacdonald. 2008 marks the first year for the Canada Army Run. The Run is styled after the U.S. Army Ten Miler and the Marine Corps Marathon – world-class events that have become military traditions, attracting hundreds of thousands of military and civilian runners and spectators from around the world every year. The Canada Army Run will showcase the Canadian Forces and the whole of government contribution to domestic and overseas operations, promote physical fitness and esprit de corps and support our recruiting efforts. In addition to the Run, the event will include a race expo with military displays and salute to the military and para-military forces post 9/11 as well as an evening of entertainment and an army style pasta dinner. Military families will be given special recognition at the Run, injured soldiers will be invited to participate to show that the fight continues and a shadow run will be held in Afghanistan to give soldiers serving there the opportunity to be part of a unique, shared experience. All proceeds will go towards Soldier On and the Military Families Fund."